Rachel Von | The Journal Gazette Byler Lane Winery's Rachel Byler pours a glass for Bobbie Fretz as her brother, Tracie Brunson, center, enjoys a drink during the Michiana Wine Festival at Headwaters Park on Saturday. Ashleigh Wasylk swirled the wine in her complimentary glass before drinking it like a pro. 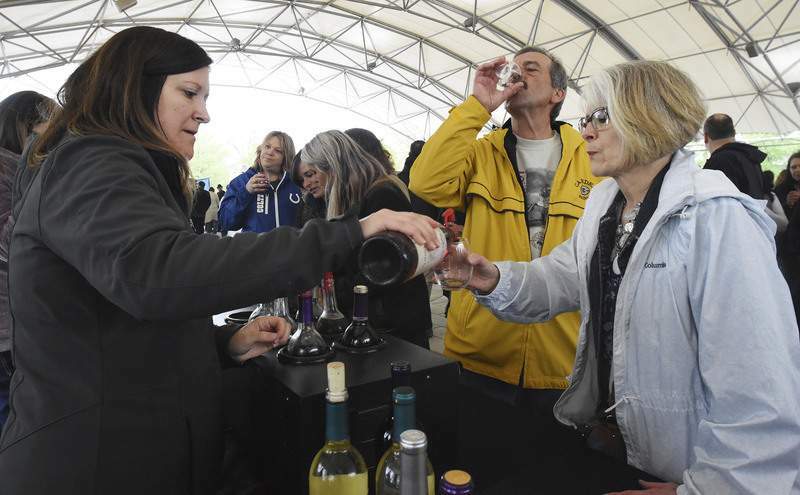 “Very refreshing,” said Wasylk who lives in Hoagland and was one of more than 2,500 people to attend the first-ever Michiana Wine Festival on Saturday at Headwaters Park. The wine, called Plonque, is a sweet Concord grape wine and is Two EE's Winery's best seller, according to Eric Harris who owns the winery with his wife, Emily. Harris, who worked at Joseph Decuis restaurant in Roanoke, before opening the winery four years ago, said the name takes inspiration from the British word for cheap red wine, plonk. And at $11 a bottle, Plonque is reasonably priced and it's a crowd-pleaser. Two EE's was one of 16 wineries from Indiana and Michigan that set up a booth at the festival organized by three best friends – Nichole Thomas, Cristal Reader and Lisa Beber. The women had visited other wine festivals and thought Fort Wayne needed one, too. Along with the wine-tasting, there were nine food trucks, about 45 craft vendors and live music. Two EE's has a similar program with tastings and music, spring through the fall, at their winery just outside Roanoke on U.S. 24, Harris said. Country Heritage Winery & Vineyard on Lima Road in LaOtto, does the same, said Jennifer Lutter who owns the winery with her husband, Jeremy. While Two EE's started off as a hobby that turned into an obsession, as Harris said, Country Heritage developed from a farm. “We were selling blueberries to wineries,” Lutter said. The Lutters have expanded their winery twice and went from selling 4,000 gallons the first year to 25,000 gallons six years later. Their wines are made from grapes and other fruit, she added. Lutter has seen interest in wine grow as Hoosiers embrace the beverage. “They're getting more knowledgeable, drinking more and they're having fun with (wine) and that's the most important thing,” Lutter said. “Indiana has a lot of wine to offer.” The cost of a bottle of wine at Country Heritage ranges from about $10 to $30. The festival cost $30 for one person or $35 at the door. The additional cost didn't stop a lot of walk-in traffic Saturday even though the weather wasn't cooperating – being cold, windy and wet. Guests were primarily from northeast Indiana with some coming from nearby states. “We're so excited,” Thomas said. “We did not know what to expect.” The women are already planning next year's event.